Quite possibly the most efficient multi-microphone piano sample available! Extremely efficient Professional Multi-Output Piano Sample Library designed for producers and performers. The Studio Grand Piano LE has four microphone pairs to choose from. Without even adjusting the volume of each of these microphone pairs, the user has 24 different variations for the sound of the piano that are controllable in real time by simply activating combinations of microphone pairs either on or off all without loading or unloading samples and without bogging down your computer. The microphone pairs also have volume controls to blend the perfect piano sound. This product is also available as part of the Grand Piano LE Bundle. The Studio Grand Piano LE is sampled from a Yamaha C3. Hammer Microphones – Inside the piano for a bright attack. This is what you typically hear in other piano samples (such as workstation keyboards and other sample libraries), but, of course, without the other microphone pairs to add life and warmth to the sound that the Studio Grand Piano LE has. Mid-Side – Located just outside the piano. These samples give a different perspective and warmth. You can use the mid-side sound on its own or combine it with other microphone pairs to give breadth to the sound. Spaced Pair – Just outside the piano by the lid for a more balanced sound and stereo image. The spaced pair are fairly neutral sounding, but give the user a good sense of the true tone of the piano. Room Microphones – Captures the live ambience of the studio the piano was sampled in. No need to add artificial reverb to get that “studio” sound. These microphones add dimension, personality and realism to the studio piano sound. Four phase-aligned microphone pairs for complete control over the piano sound! Note: Compatible with the full version of Kontakt 4 or Kontakt 5 only. Not for use with Kontakt Player. As a bonus for Studio Grand Piano LE users, included with purchase is a download link to a pedal noise instrument, “Studio Grand Piano LE Pedal Noises 7RR.nki”, that matches the Studio Grand Piano LE. This instrument makes the sustain pedal generate authentic damper noise and has 7 sounds setup to round robin. 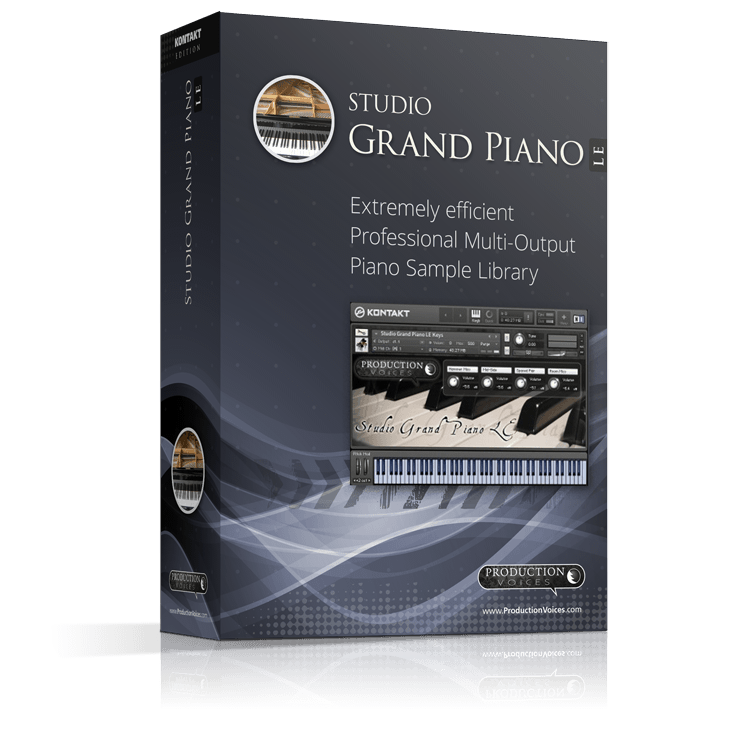 After you download the pedal noise instrument, open the Studio Grand Piano LE in Kontakt, add the Pedal noise instrument underneath and change the MIDI channel to match the Studio Grand Piano LE. The sounds from “Studio Grand Piano LE Pedal Noises 7RR.nki” can only be heard when the sustain pedal is depressed or released. The pedal noise nki is a bonus and currently is not something we are providing technical support for. Future releases may include the pedal noises within the main Studio Grand Piano LE instrument. Users who have previously purchased Studio Grand Piano LE and have not received the bonus pedal noises can contact us to receive it for free. Enjoy!